After making numerous bead-embroidered necklaces, I was looking for a change of technique. Freeform peyote, netting, and brick stitch appeal to me, but I still wanted some sort of support for the work. Heavy gauge sterling silver wire makes an excellent armature to work around. 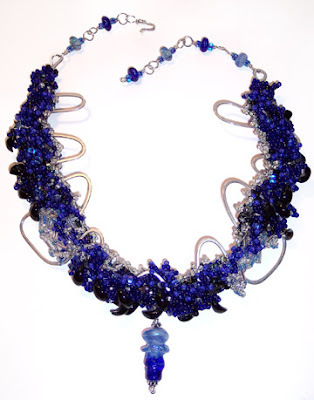 My inspiration for this piece came from Lynda Musante’s lovely book, Exquisite Beaded Jewelry. Lynda shows how to make a bracelet using wire links as a base. My piece uses a single strand of wire instead, but the look is very similar, so I would be remiss in not acknowledging her inspiration! 1. 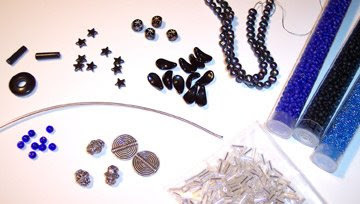 Assemble a collection of seed beads and assorted accent beads that you might use. 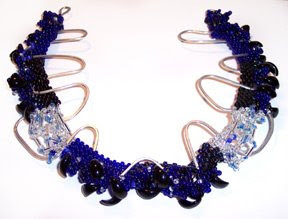 I used mostly 8/0 and 11/0 seed beads, and some larger stone and glass accent beads. 2. Bend heavy gauge sterling silver wire into a curving shape, approximately 15 inches long from end to end. I used 40 inches of 14 gauge wire to create the shape you see below. Bend it into a gentle curve, using a CD case as a guide if desired. Form a loop onto each end and hammer the wire flat with a ball peen hammer. 3. String 16 inches of 8/0 seed beads in blocks of colors. Peyote stitch along the band with the same colors, doing two complete rows. Weave the band through the sterling silver armature. 4 Starting at one end, peyote stitch around the doubled wire below your loop. Stitch along the outer edge of the peyote band, wrapping the thread around each wire that you cross. This will be covered by future work. Cover the other doubled wire end below the second loop with peyote stitch. 5 Stitch back and forth from end to end along the outer edge with freeform peyote and netting stitch. Add ruffles, bridges, and arches as you please. 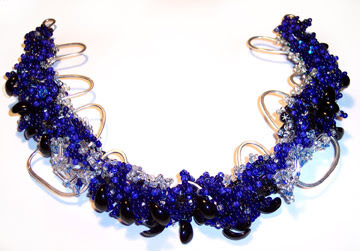 For your final rows along the outer edge, add some larger decorative beads or dangles. 6 Move to the inner edge and build that up with peyote and netting stitch until the necklace is as wide as you desire. This is a good area to add larger decorative beads and to freeform stitch around them. I finished the inner edge of mine with a metallic bead ruffle. 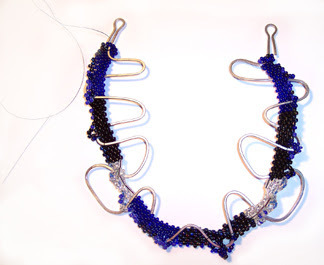 7 Work up and down the middle band of the necklace, adding arches, bridges, and ruffles wherever you want more fullness. I added small hematite star beads on wrapped-loop sterling headpins as well as more peyote ruffles. 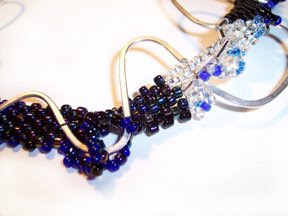 8 Make a beaded chain and hook closure. I used 20 gauge sterling silver wire for the wrapped hook, and heavier 18 gauge wire for the bead links and to mount the focal bead with a wrapped loop. Using a few more seed beads to hide the thread, stitch the focal bead into place. What a magnificent neckpiece! Great work Cyndi. Luv this piece! Spent most of this evening bouncing around your blog. Had great fun! I hope you keep up this blog. Wow- this piece is truly inspired! I can just feel the creative energy flowing off the computer screen :) Glad I discovered your blog!